President Barack Obama walked into a bar. That's not just the beginning of a joke, it's the beginning of the whirlwind that was Obamamania last night in Boulder. On his way to his big speech at CU-Boulder on keeping student loan rates low, Obama stopped by one of Boulder's favorite dives to pick up a pizza to go. 9News spoke with Chris Heinritz, owner of the pizza restaurant on "The Hill" area of Boulder, who said Obama "came in and shook everyone's hand, was very gracious. He took time out ot meet everyone in the place." Before leaving with his pizza--he reportedly ordered a pepperoni, sausage combo pie called the "Sinkza"--the president even signed The Sink's wall, the tradition at the Boulder restaurant and bar. 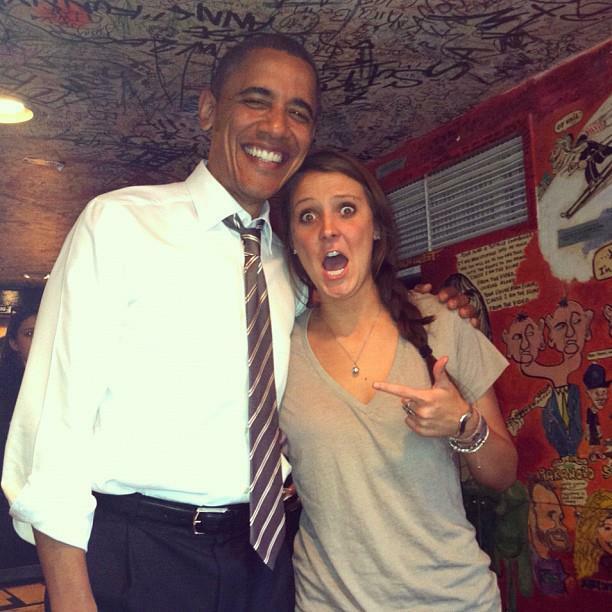 While at the sink, Obama snapped a photo with a CU-Boulder student named Madalyn Starkey that went viral and really sums up the energy and excitement of his visit. See the full image and slideshow below. The Denver Post reports that the first sitting president to visit Boulder campus did have one mishap -- after dining at the sink a girl spilled yogurt on the president. But Obama took it in stride and good humor saying, "Getting yogurt on the president, you've got a story to tell." The crowd cheered for Obama on multiple occasions throughout his speech and even began chanting "Four more years!" at one point. In one of many moments of applause and cheers, a student shouted out to Obama, "We believe in you!" and Obama, not missing a beat, responded: "I believe in you!" The crowd went wild. Obama was in full campaign mode and delivered a passionate speech about keeping student loan rates low and many times spoke from the heart or from personal experience about the burden of student loans that he and Michelle know firsthand, "This isn't something I just read in a briefing paper. When we got married, we got poorer together. We paid more in student loans than we paid for the first condo we bought together." To put things in perspective, Obama went on to say that he and Michelle had paid off their own student loans only eight years ago. The speech was centered around student loans because in July the interest rate for subsidized Stafford loans will double unless Congress prevents the loans from doubling, 7News reports. His speech, which lasted about 30 minutes, urged the CU-Boulder students to call their representatives and demand that they stop their student loan rates from doubling and offered up a Twitter hashtag--#DontDoubleMyRate--to keep the conversation going online. For more information about the student loan rate debate, check out The Associated Press's guide to student loans.